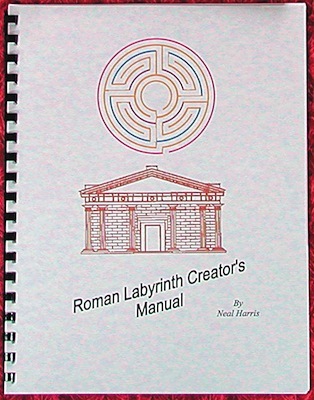 11 page, step-by-step Roman labyrinth manual with color diagrams, for designing various sizes of the ancient 8-walled Roman labyrinth pattern (also known as the House of Theseus design). This design is an angular version of the Cretan, revived by labyrinth enthusiasts from the face of ancient Roman coins. 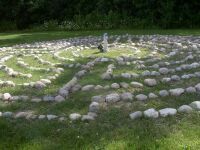 It connects with the masculine energies found in both males and females. While the Cretan design takes you on a free-flowing journey throughout its’ pattern,the Roman design has you finish a particular quarter of the design before it takes you into the next quarter (all four quarters are journeyed through in progression before reaching the center.) This is often referred to as linear or straight-line thinking. Interestingly, this is also the way Romans laid out their cities. 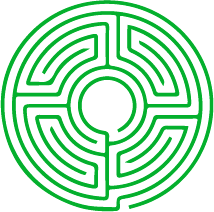 The Roman labyrinth manual guides you through the process of laying out and building this ancient design and makes this process as simple as possible.